In 2008, a Texan game developer, Red Fly Studios, created a game that featured sentient fungi. It was the start of the Mushroom Men series, games set in a post-apocalyptic world where a mysterious comet from space mutated the human race into different types of fungi. The “mushroom men” of the same fungal types segregated into different villages and started a war with each other. In the first game of the series, called Mushroom Men: Rise of the Fungi, was a Nintendo DS side-scrolling platformer. It set the stage for the Wii game that came out a year later called Mushroom Men: The Spore Wars. It was a full-3D platforming game that featured Pax, the hero of the war, and his journey to figure out where he belongs. While the two games were Nintendo exclusives, the series scored enough good reviews to merit a second sequel. 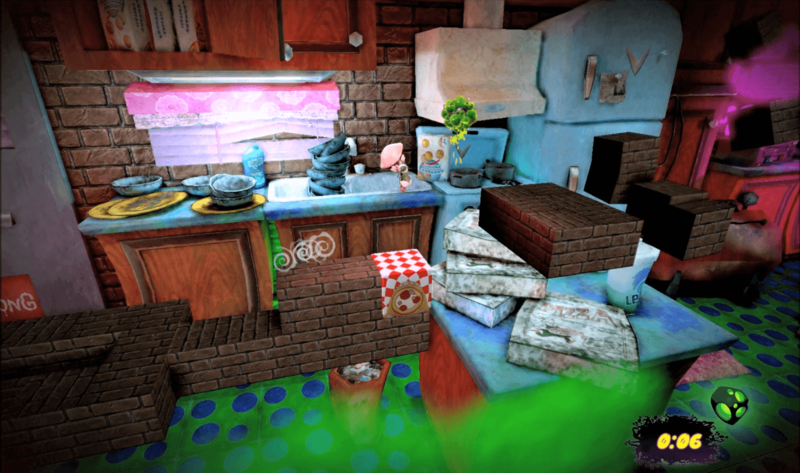 Eight years later, however, Red Fly Studios used a crowdfunding platform to develop the third game called Mushroom Men: Truffle Trouble for the PC via Steam. Truffle Trouble follows Pax once again as he is trapped in a terrible nightmare. He is being chased by the Truffle Princess, an entity that is really an atrocious being despite its regal name. Pax’s nightmare also involves a number of obstacles hindering him from running away from the princess: blocks, slides, cannons, and insects to name a few. Fortunately, Pax is able to mutate into other forms. It is a dream, after all. The five forms give him an ability to flee faster from the Mushroom Princess. Unfortunately, the power does not last long. While the plot is certainly interesting, it does bear a heavy resemblance to an Atlus game for the PS3 and Xbox 360, featuring a man having nightmares over his commitment problems to the girls he is dating. In that game, the “mushroom men” are replaced by “sheep men” while the Princess is replaced by Death. That game is Catherine, by the way. There are also many Catherine resemblances in Truffle Trouble’s gameplay. To escape the Mushroom Princess, Pax has to maneuver his way over, under and around the many obstacles obstructing his path. 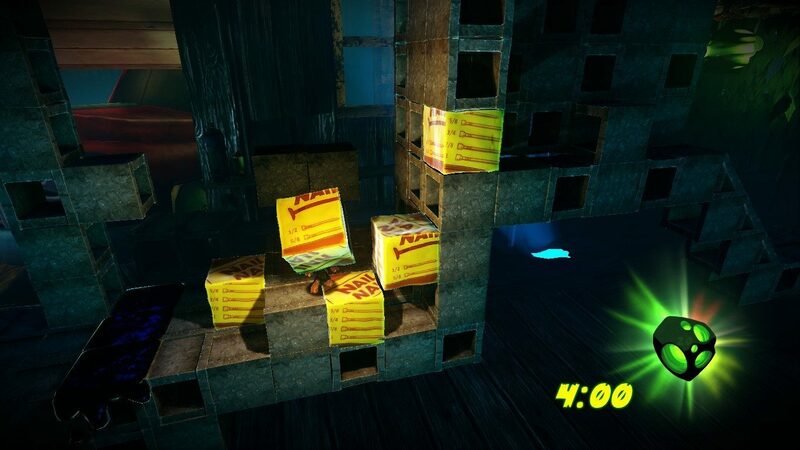 The layout of each stage is filled with blocks, and Pax has to lift, push, and pull these blocks in order to progress through the level. Progression is done horizontally (i.e., from left to right), and Pax must move quickly or else the Mushroom Princess will catch him resulting in a GAME OVER. Just for reference, in Catherine, the progression moves vertically (i.e., bottom to top) and also results in a GAME OVER if the protagonist does not move quickly through the level. In order to mutate into other forms, Pax must store mushroom spores by either killing insect enemies or collecting free-standing spores. After a certain amount of spores are stored, he can freely mutate and use the chosen form’s ability for a short amount of time. 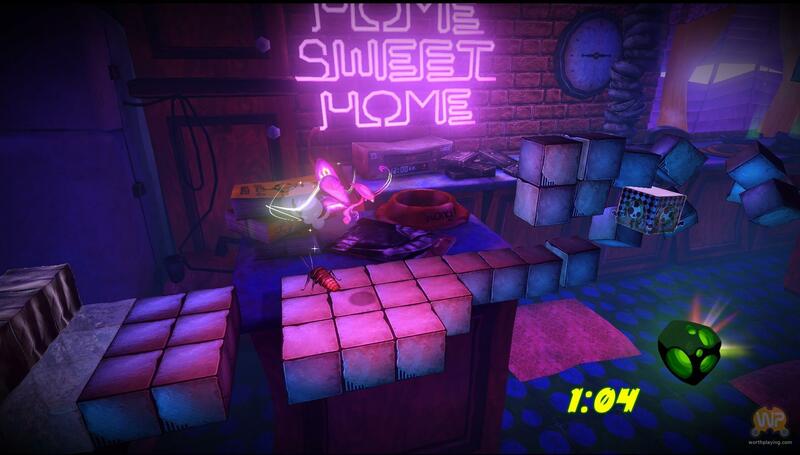 The free-standing spores also serves as the game’s collectible aspect; both the amount of free-standing spores collected and the time it takes to complete the level affect the stage’s overall score. 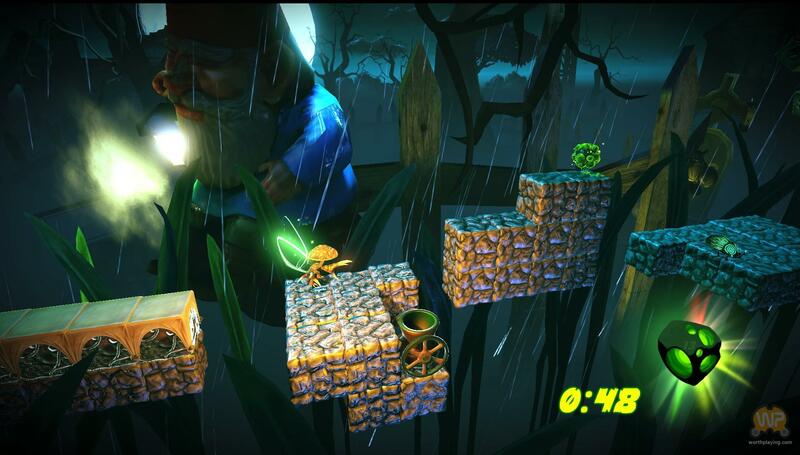 As a platformer, Truffle Trouble is a fun and challenging game. The best part is knowing that there are many ways to complete a level, and finding the fastest route to finish a level (and get a better score) is a constant challenge. Truffle Trouble gives a few options to control Pax: a keyboard or a controller (preferably, an Xbox controller). While the Xbox controller option was unavailable during this review, it is heavily recommended to use one. The keyboard controls can be difficult; there is a dedicated button for pretty much all of Pax’s actions, from lifting blocks, jumping, and mutating into other forms. The design decision results in around eleven buttons, including movement controls, to control Pax, and it can easily create confusion and frustration. Mushroom Men: Truffle Trouble is certainly a great game for platformer enthusiasts, especially those who have enjoyed Catherine for the major consoles. Just be mindful of the plot–it might have been somewhat told before. Also, it might be a good idea to procure an Xbox controller before indulging in this game, since the keyboard controls can be a pain. To find more about Mushroom Men: Truffle Trouble, visit its Steam page.